You probably don't give much thought to what appears on the YouTube homepage every time you visit. You should, however, especially if you have a YouTube account. Let's take a look at some of the settings you can--and possibly should--change. 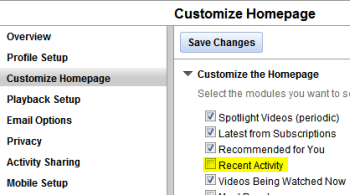 As you can see, YouTube offers about dozen "modules" you can add to or remove from your homepage. Most of these are pretty self-explanatory, but there are few worth discussing. Second, if you upload a lot of videos and want to know how they're trending, enable Insight Map and Insight Chart. When you return to your homepage, you'll see various statistics and data on how (and where) your videos are being viewed. Third, after clicking Save Changes and returning to your homepage, click the Edit link atop any module that has one and you'll be able to make changes to how many videos are displayed and in what layout. Finally, if you want to change the order in which modules appear on your homepage, just click their corresponding up/down arrows. For example, if you want the aforementioned Insight Map to reside at the very top, click its up arrow repeatedly until it lands there. YouTube offers a lot more homepage customization than most people think. Experiment a bit and you'll be able to configure your own page exactly how you like it.